The FS400 series are true multi purpose, robust, compact concrete and asphalt cutting saws, ideal for a wide variety of small to medium sized floor sawing applications and full of innovation. 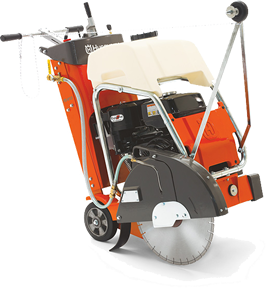 The FS410 has a patent-pending engine and bladeshaft mounting system which reduce overall vibrations levels and produce better cutting performance. 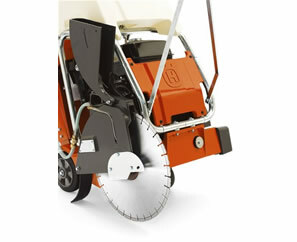 The FS410 has a comprehensive operators console with engine throttle, emergency stop switch, tachometer, timer and depth indicator all at the operators finger tips, and a patent-pending spring-assist screw feed blade adjustment which reduces the force required to adjust the blade in and out of the cut. The FS410 also has a large polyurethane water tank, making it ideal for the wet and dry cutting of concrete and asphalt.